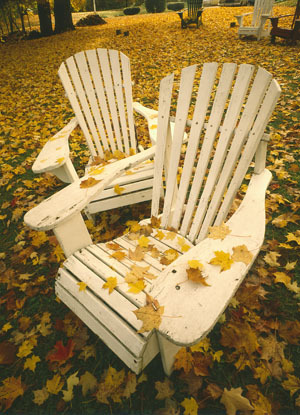 Adirondack chairs are a classic New England artifact, particularly when the backyard is carpeted with fallen leaves. I think many people set them out as a prop or piece of sculpture, because they’re truly far from comfortable. As I scroll through my memory and my negatives, adirondacks almost always appear empty, facing the seaward view with a counterpart, or lined up in a row of four or five, as though waiting for a group of friends to drop by to exchange town gossip for a lemonade. The wide arm encourages a cold, ice-filled glass or library book, and perhaps in olden times a basket of varying colored spools of thread and a darning ball. But who has time these days to sit outside in a chair and read, never mind darn a sock.